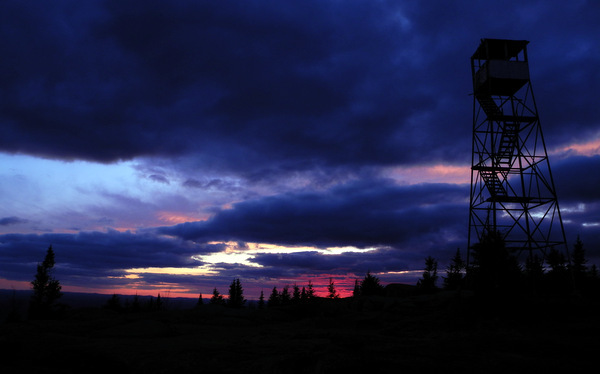 What's your favorite fire tower? Reclimbed St. Regis a couple of days ago. It's a really nice trail to a great view. You can't climb the tower because the lower couple sections of stairs have been removed, but you don't need to to see the view. I've climbed St. Regis numerous times... always meant to go back and do it as an overnight (the clearing where the observer's cabin used to be is now a designated tent site) but haven't done so yet. I was reading in an old guidebook that there also used to be a lean-to on the trail up St. Regis, but it was apparently removed at the same time as the observer's cabin. I originally climbed St. Regis from the old trailhead down near the Topridge gate. The last 3 times has been via the new trail, and it really is a pleasant trail that seems to be well built and well maintained. Do you know if the students at Paul Smith's are involved? I thought I remembered hearing that somewhere. My new favorite is Vanderwhacker. The view is incredible and there was no crowd. Hopefully my next climb will be Adams, may have to change my vote again. Hopefully my next climb will be Adams, may have to change my vote again. Nice photo! What kind of camera do you use? Four more towers to complete the challenge - but so far Adams, Owls Head, and Poke-O-Moonshine are my favorites. List may change after I finish the challenge. Here's a couple of recent photos from Adams. I remember Noble Mtn tower...was the first one I ever hiked to when I was 7 or 8 years old. It the had the coolest suspension bridge across the West Canada Creek...someone must have some old pictures of that tower + bridge ? the bridge is still there i go up and play on it and hike every couple months, and snowy has to be my favorite so far. Last edited by mmetzgier; 09-19-2012 at 06:45 PM.. I've only been up Poke-O-Moonshie so that is my favorite...For now. Vanderwhcker and Hurricane are next. Seems that Adams is the winner with 6 5/6 votes. The view is spectacular 360° around. The tower is the tallest in the park, and it definitely feels that way in the cab! (Not located at the highest elevation, but the tallest actual tower) The first two miles of the hike are flat and make for a pleasurable walk, mostly alongside a mountain stream, while the last mile is steep enough to help keep some crowds away. The trailhead´s relative remoteness compared to nearby towers helps as well. This past summer I hiked up and had the entire trail and tower to myself and my dog - only two people had signed the register before me that day and they had already finished. That same day I drove past Blue Mtn´s parking lot and there must have been at least 25-30 cars at the trailhead. You can see Blue and its scars all the way from atop Wakely (and the cell tower on Blue if you look very closely) and I couldn't help but think of all the people over there while I was all alone in 'my' cab. And lastly - it certainly doesn't hurt that the trailhead is situated just a few miles down the road from my family's camp! without a doubt, Mount Adams. Dare to dream. If you don't dream, you don't become. Dreams are indicative of what we can do, when we let our dreams flourish. Don't let negativity from inner or outer sources thwart your dreams. The human spirit is capable of much more than what we can see.